Tony Stewart struck and killed a fellow sprint car driver who had climbed from his car and was on the track trying to confront Stewart during a race in upstate New York on Saturday night. Stewart was reportedly unhurt but announced at Watkins Glen International that he would not drive in Sunday’s Sprint Cup race. He will be replaced in the No. 14 Stewart-Haas Racing Chevrolet by Regan Smith. At 10:15 a.m. Sunday, Stewart-Haas vice president of competition Greg Zipadelli appeared in the WGI media center to announce that Stewart would not participate in the Cup race. “We know that it’s just an unbelievable tragedy,” Zipadelli said. “Our hearts go out to, obviously, Kevin’s family … thoughts and prayers. This is a very tough, very emotional time for everybody—his family, our family, Stewart-Haas, Tony Stewart. With that being said, we feel that, as a group, Tony will not drive today. The victim was reportedly Kevin Ward Jr., 20. The incident occurred at Canandaigua Motorsports Park. It comes almost exactly a year after Stewart suffered a season-ending leg injury during a sprint car race in Iowa. Video of the incident shows Ward, wearing a black fire suit and black helmet, walking on the track after being wrecked. Ward was reportedly pointing at Stewart’s car as it came back around the track after the wreck. When hit by Stewart’s No. 14 winged car, Ward was flung down the track. According to the Associated Press, Ontario County Sheriff Philip Povero confirmed the driver, whom Povero would not identify, was dead on arrival to an area hospital Saturday night and that Stewart was the driver who struck him. He said that his department’s investigation is not criminal and that Stewart was “fully cooperative” and appeared “very upset” over what had happened. Stewart is co-owner of Stewart-Haas Racing, the four-team NASCAR organization that fields cars for Stewart, Kevin Harvick, Kurt Busch and Danica Patrick. 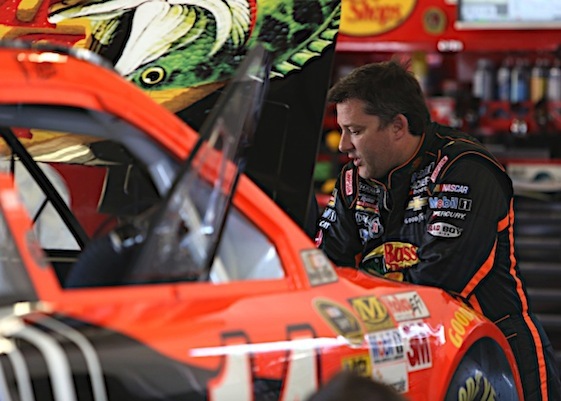 Stewart was scheduled to start 13th on Sunday at Watkins Glen International in south central New York state. Smith will have to start from the rear of the field. I hope the (primarily) responsible racing fans who gather here avoid the “Tony Stewart-murderer!” or the “stupid kid deserved it!” comments plaguing social media sites. If one chooses to offer either of these response types here, I will be glad to provide a free punch on your Idiot Card.